A mother’s stunning image of a baby at seven weeks shares the obvious humanity of preborn children and the inhumanity of abortion. 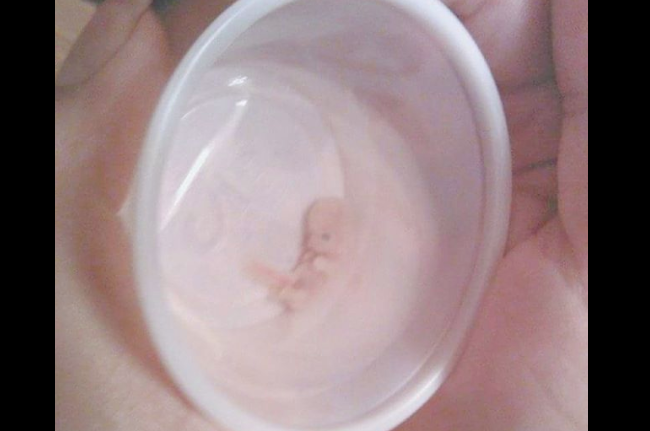 Posted by Save the Storks, mother Karla’s image of her preborn baby — with tiny fingers and toes, a little face, eyes, nose, and even a visible brain — reveals that children in the womb are not simply “clumps of cells,” as the abortion industry so often claims. “Why is she so pro-life?” some might ask. This is my baby at seven weeks in February 2014. The picture is not very clear but I could see his tiny fingers, his little brain, little eyes, and I could see how his mouth could open. At this stage, Baby Center notes, “tiny veins beneath parchment-thin skin” are visible, and both hemispheres of the baby’s brain are developing. The liver “is churning out red blood cells,” and the child has an appendix and a pancreas. This photo reveals the sheer miracle of fetal development and human life in the womb.